In which PSB discuss their debut album, WWII and the EDL, Mogwai, Interpol, potential collaborators and classical music. We’ll begin at the beginning, how did you decide to start making this kind of music? [J Willgoose Esq] We’re gonna get asked that quite a lot, yeah, I don’t really know. I mean, I was listening to an archive hour program on radio 4, which seems apt enough, it was Tom Robinson presenting a program about the release of some new COI [Central Office of Information] films online and one of them was quite a famous one called ‘Coughs and Sneezes Spread Diseases’. I ended up making a song using that as the basis for it and then played it to a few people and they said it was actually quite good, which was the first time I’d ever played anyone anything and they said it was quite good so just carried on from there really, and things have grown beyond all my biggest hopes really. Before then had you played in any bands or made music before? [JWE] I’d been through several incarnations, yeah, never had any success really, at all. I’d always played guitar, guitar was sort of the main thing and a couple of my old bands sort of broke up so I started learning how to do stuff on my own, and learning how to record stuff, and make things sound alright. So it as all kind of leading towards it without really knowing it. Is getting the samples from the films a pretty difficult thing to do? [JWE] It depends who owns the rights to be honest with you, it’s the BFI who gave us all The War Room footage. They’re extraordinary, they’re brilliant, you can just phone them up and say… well I did just phone them up and say this is what we do, this is what I’d like to do and I sent them an example video and I think they got over some initial confusion and then they’ve been right behind us all the way, really supportive and really accommodating. And then there’s other people who you just kind of meet a corporate wall of ‘you need to pay us £400 pounds for every 5 seconds’. How much of the music that you make is dictated by the films you pick or is it the other way round? [JWE] Sometimes I’ve got a musical idea and it sends me off looking for films in a certain way, like for Signal 30, which is going to be the new single, I had a very fast aggressive guitar, most of it written, and I thought, well what could that song possibly be about, well there’s loads of driving information films I’m sure, if you’re gonna about ‘don’t drive fast’ it should probably be a fast song, counter-intuitively. In that case it was that way round, but in other cases, with ‘Everest’ for example, it was the other way round. I don’t write to picture, I don’t sit there and try and come up with a melody while watching people go up a mountain, I just take a feel from it away and then write something, then go back to it and try and put it together. How important is the video to the music? Pretty much everything you’ve released has had a video to go along with it. [JWE] Well when it started it was just me, and no telly or anything, and then after a year of doing gigs, and it went down really well, then I added the television and edited the films so they all kind of fit, it started to go down even better because I think people could kind of see, it’s a big visual element I suppose. In a way it’s become the frontman, it’s what takes people’s attention and we just get on with playing the music around it and just enjoying ourselves really. It’s quite good because it’s a frontman without any ego or any ridiculous rider requirements. [JWE] It is finished, the title is ‘Inform – Educate – Entertain’, in keeping with our Reithian ideals [John Reith founded the BBC with those ideals]. We’re basically putting it out ourselves so there’s been quite a bit of stuff to do behind the scenes. Somehow I’m now the owner of two limited companies, which is a bit odd, hopefully I don’t get disqualified from running them. Do you feel there’s any political edge to the music you make? [JWE] There probably is. With the World War Two footage it was really hard trying to make it as apolitical as possible; just try to leave it as a comment on what people at the time thought of it rather than try and put any of my own spin on it. I really didn’t want to do make it very patriotic, and a few people have picked up on it, and that’s what I really appreciate. ‘Spitfire’ for example, so many reviews of it say, it’s a stirring, patriotic thing… with a Krautrock beat, and yeah, good, glad you got that, because it’s supposed to undercut any y’know… God forbid the bloody English Defence League get hold of it, that’d be horrendous. There’s nothing inherently wrong with patriotism, it’s not believing your country is better. There’s nothing wrong with saying you’re happy to be from England. I am very happy to be from England, I think you’re incredibly lucky if you’re born in this country, even today. But I certainly don’t go out there waving flags around, I don’t get involved in Jubilee celebrations or anything like that. When I was listening to ‘London Can Take It’, it’s very hard not to feel a stirring pride with those words. [JWE] Well, actually, as someone from London that probably was a bit more from the heart, from me, maybe. You can kind of name on one hand songs about London, but people fawn all over New York, Alicia Keys and bloody Frank Sinatra, Ryan Adams, millions of songs. Even Manchester, I reckon, has more songs, Doves, Elbow, The Smiths, everybody’s on about how great Manchester is. Maybe London doesn’t need to do that because it’s big enough and self-assured enough that it doesn’t have to shout about it, but I was of the view that it’d be quite nice to write a song about my hometown. Yeah, maybe there was a bit more, personal feeling in that one. I don’t think that’s particularly tub-thumping, just a bit of pride maybe. What kind of bands are influencing the music you make? With The War Room EP, I definitely heard a lot of Kid A / Amnesiac era Radiohead. [JWE] You’re the first person who’s said that, but that’s good because there definitely is. Kid A is probably one of my all-time favourites. I’ve got it framed in my living room at home, it’s an extraordinary album. Definitely Radiohead, as I get older I just listen to more and more stuff y’know. The rhythm from ‘London Can Take It’ is actually taken from, well I got mildly obsessed with this Dancehall compilation called ‘Invasion of the Mysteron Killer Sounds’. It’s all like ‘boom boom cha, boom boom cha’ so I kind of borrowed that and wormed its way in. Various other bits and bobs, I found some amazing south Indian soundtrack music and some of that got in there on various levels. The bedrock, my musical education it was Oasis when I was about 14 and then moved on to Radiohead. I’ve got a soft spot for John Squire of the Stone Roses, I have to say, but I can’t play guitar like him, so we’re never going to sound like them. We could do some drum talk, are you playing an all acoustic kit? [Wrigglesworth] No I’ve got a lot of triggers and a pad, a Roland SPD-SX, it’s really good actually, I’d recommend that strongly. I play a Pearl Masters MMX kit to be precise. To be honest, I don’t know much about drums, I just hit them. I get what I think sounds nice and play it. [Wr] It’s a black panther. Do you have any plans for expanding the sound? [JWE] He’s a mean percussion player so the plan is to get him a little glockenspeil, xylophone, marimba… We can sneak it in there between the two toms. No it’d be nice to get some live glockenspiel in there, have you ever seen Wilco live? Their drummer does an amazing thing he plays two mallet glock while playing the drums with the other hand it’s absolutely incredible, just watching him open mouthed like how is he doing that… So that’s what we’re going to do. I think one thing that has kinda characterised it, I’ve been doing this for about 4 years, is it’s just been getting bigger and bigger, not in an unnatural way but in a quite organic way. I think you’ve gotta keep, not building, but at least changing things and definitely the next thing after this album I’d love to get more musicians involved, different musicians, different kinda sonic pallet, broadening it out a bit. Any collaborators you’d like to work with? [JWE] Ha, I’ve got a long list. Eventually it’d be nice, if it happens in a natural way, it’d be nice to start having some vocals on some records. For some reason I got asked, and it was one of the few questions that’s ever riled me, ‘what happens when you run out of footage?’ Who else gets that, why do we get that? When they said ‘what happens when you run out’, well, first of all do you know how much footage there is, even in the BFI’s archive? You could work on that for years and have enough variety and enough stuff to keep you going. Secondly, would you say that to singers, ‘what happens when you run of notes? There’s only 12 of them, what are you gonna do?’ That mildly annoyed me and we’ve had it from a few critics as well, they think it’s a bit short-lived maybe, maybe it’s a one-album thing, but I’m quite stubborn. I’m quite keen to prove people wrong so hopefully we will. We’re not taking anything for granted anyway, I’ve got an idea for the next thing and I hope it’s gonna be big enough and different enough that we could silence a few people. Your music has been really popular with the public as a whole, you won rebel playlist 4 times, is there something about your music that resonates faster than other people’s? [JWE] Yeah, I don’t know what that’s about. I mean each time I thought ‘we’re not going to win’. The first time we were on it we had 250 people following us on Facebook and one band had 20,000 and we won. We seem to have quite an active following. They don’t just seem to like it and think it’s ‘alright’, they actually seem to get into it and really buy into it, which is absolutely fantastic. So… Thanks! I think part of it might be that with instrumental music it’s easier to bring your own feelings to it, you don’t have somebody’s ego stamped all over it with a singer wailing all over it. For me a lot of the reasons I don’t like bands are that I don’t like the voice. Like The Smiths, I like the music but Morrissey’s voice is all throaty, it’s the same melody it’s up and down, it’s boring. You can’t really say that with speech, that the melody’s boring, it’s just speaking some words. I think for people of a certain age the WWII stuff gets an instant response, especially people who lived through it: I went to speak to Janice Long on Radio 2, and it has an older audience anyway, and she’d had an email in from ‘Muriel’ which tells you enough anyway, and when ‘London Can Take It’ came on and she heard the air raid sirens she burst into tears instantly and then threw up, and then listened to the rest of the song and loved it. My aunt, who’s kind of the matriarch of my dad’s side of the family, she gave me all the photos of George Willgoose whose banjolele was passed down to me. He was 26 when he died at Dunkirk and she can remember being in the Second World War. I just think our generation doesn’t have a clue, including me, we don’t have a clue. You see some of the photos in the film for ‘London Can Take It’ especially, it’s just staggering. If you can imagine that happening every day, people getting on with it without fuss, not going on twitter to moan about the tube being down. It’s interesting you say that because I think a lot of the way we choose to define ourselves is buried in the Second World War era, that’s why the EDL and such like to go on about it. It’s a key part of the British Identity, all the underdog spirit is borne out of the last great thing we actually did. [JWE] And it was a great thing. There’s no beating around the bush there, that was the right side to be on unequivocally. I haven’t read much about WWII and I didn’t do History so I don’t want to start pronouncing on things I have no idea about but it did financially break the country and that’s why the empire collapsed because we basically bankrupted it for years fighting this war, even with America’s help which was sizeable to say the least. It was our last hurrah I suppose. I wouldn’t say it was a Pyrrhic victory but it was almost verging on that because we lost the influence we’d had up to that point. I can understand why it’s a very evocative period that some people hold on to but I think it’s good to move on from it. Are you trying to move away from the WWII focus of The War Room now? [JWE] Yes! Although Signal 30 was actually written before The War Room, I’ve been playing it since mid-2010 I think. It’s gone through a few incarnations and it’s kind of got heavier and heavier actually. So it’s not so much ‘after the war where do you go next’, Everest was a bit like that, I’d had my head in WWII for six months, I’d like something a bit more stirring and a bit more uplifting rather than terrifying. I thought it’d be really nice to do something with a good story, so yes Everest was a response to that. With Signal 30, we don’t ever want to repeat ourselves or get caught in a rut so we kind of wanted to show people, especially people who haven’t come to our live show where the intensity is a bit raised anyway, deliberately, that it’s not all received pronunciation, we have got teeth as well and we’re not afraid to use them. Which is good, when I go and see a band I want them to be like the band plus one. Who have you seen that have really done that? [JWE] Well Mogwai, for years and years and years. They’ve got an intensity live that’s extraordinary, and they’re also extremely loud, trouser flapping loud. I quite like that element to it. Bon Iver was one, after his first album, saw him in London and that was, after Radiohead at South Park, the best gig I’ve ever been to. Just walked away from that going like ‘what’s the point in trying to do anything’ it was just stupidly good. There’s been a few bands, like I remember going to see Interpol after their second album, their album is great, well the first two were great and after that it goes downhill a bit. I went to see them and just about halfway through I realised they were playing everything exactly like it is on the record. That’s not what you want to hear when you go and see a band, you want it to be kinda like the record and then more. You want it to be a different experience, more intense, maybe a bit louder and maybe a bit harder. That’s kind of what’s guiding our live ethos I suppose. Well, that’s most of my questions, only one left which is: who are you listening to now? [JWE] I went on holiday recently and I think I took the new Bat for Lashes, which was good, I listened to the new Dutch Uncles, which was good, and a lot of old stuff really, just discovering old stuff, a lot of funk especially. Do you listen to a lot of classical music then? And on that bleak note, I left for the bar, and prepared myself for their set, which you can see a review of here. Many thanks to the kind folks as PSB HQ and the band for the interview. Go buy their album now. 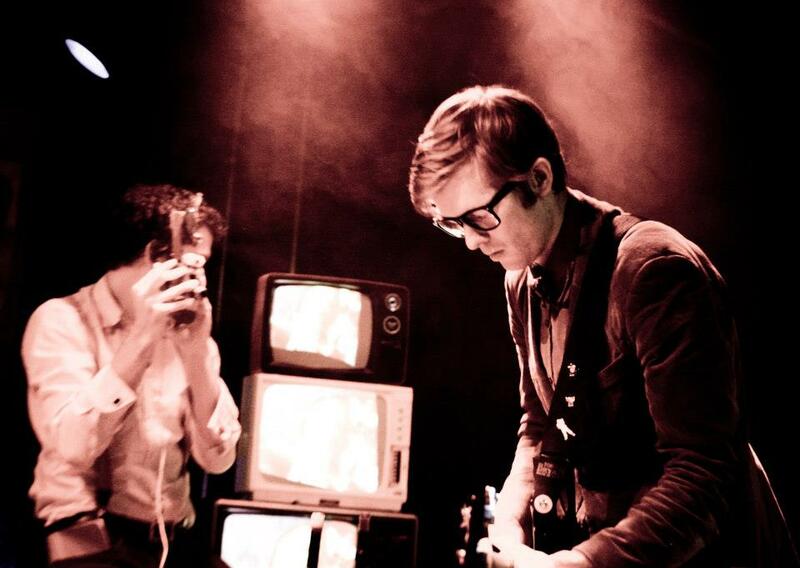 This Public Service Broadcasting interview is so amazing that we just had to add a link to our review at A Closer Listen! From one PSB fan to another, thank you!